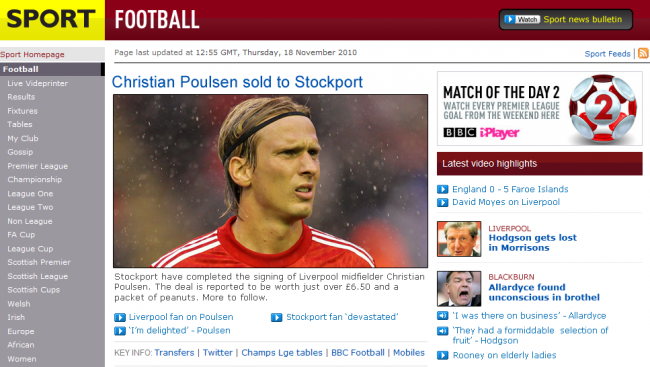 As much as this isn’t true (check some of the other headlines), I reckon there are Liverpool fans out there who would accept £6.50 for Poulsen, and screw the nuts – unless they’re dry roasted, of course. I think Im going to get cancer international, and ask the make a wish foundation for Poulsen to be sold. Or shot. Either way is fine with me. A slight improvement on my earlier offer of a packet of custard creams. After all, you could get quite a few packets of Asda’s own custard creams for £6.50. Feck, if they agree to make them cashews or pistachios, we can throw in Degen and Konchesky as well. Roy isn’t the only person to be intimidated by morrison’s selection of produce. hahahahaha are there more pictures like this one? He’s still probably better than Tansey. Stolen from RAWK without permission. Naughty. Original author -> Alonso from redandwhitekop.